The Vines Center was an entirely different world Saturday, Feb. 2, compared to just days before, when ASUN leader Lipscomb paid Lynchburg a visit. 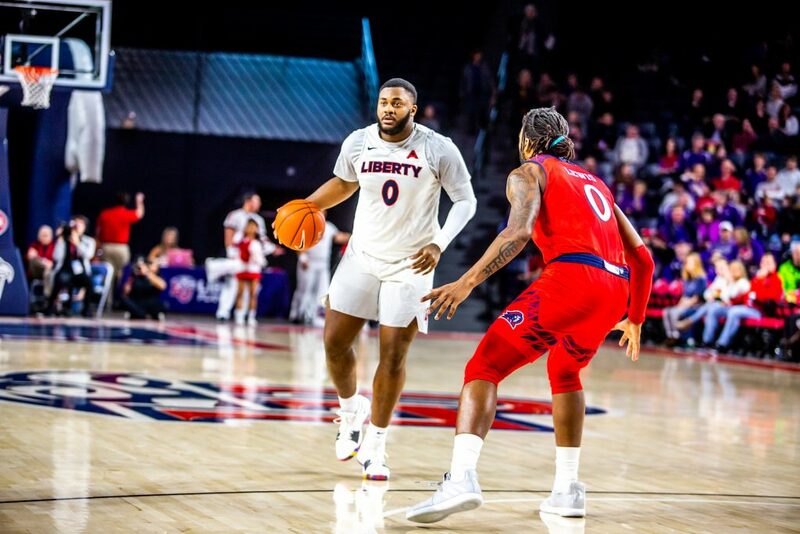 The Liberty Flames basketball team found its feet again when it took down the NJIT Highlanders 77-57. Liberty’s dominant performance was led by junior guard Georgie Pacheco-Ortiz with 18 points, closely followed by redshirt junior guard Caleb Homesley with 17 and redshirt junior forward Scottie James with 16. The game was Liberty’s chance to redeem itself after a heartbreaking 79-59 loss to the Lipscomb Bisons Tuesday night, and the team did just that. Tuesday’s game was marked with 12 turnovers, sloppy play and only 37.3 percent shooting. Saturday’s game was played with eight turnovers, sure hands and feet, and a 56.1 scoring percentage. McKay told the media Friday afternoon that he shouldered the blame for the Tuesday loss, saying he got caught up in the desire to be a top-40 team and lost sight of mature, focused play. McKay said the loss was humbling, but it was what the team needed to get back on track. According to Homesley, it was reassuring to know that McKay had their backs, but that it wasn’t all his fault.